<- Read the previous post: If you think we’re worn out, you should see our bikes! We started our day with a long shuttle to Woodstock – not the music festival, we’re not having flashbacks to the 60’s (yet). 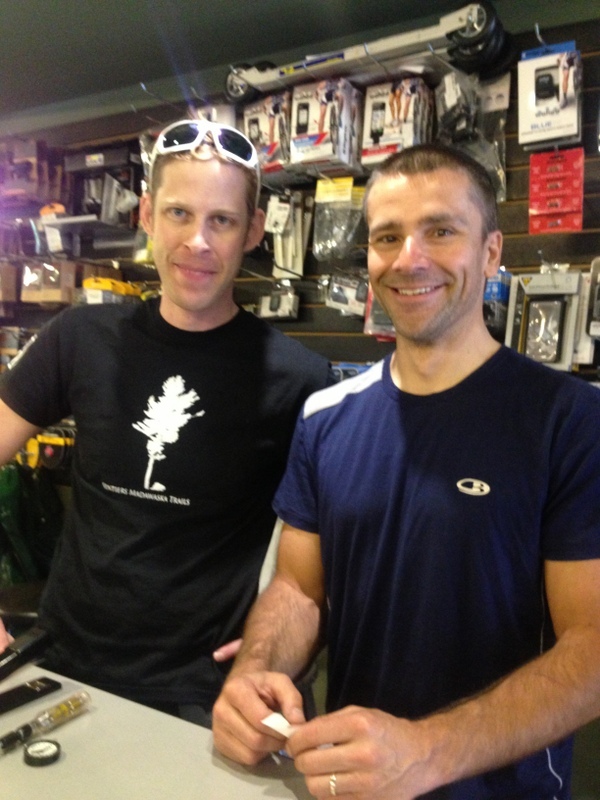 It was there that we tracked down the nearest repair possibility, Steeve’s Bike Shop. We thought we were in the wrong area, and that Suzy (our GPS) had led us astray. But no, in the middle of a residential area was the shop, in the basement of a house. What a neat little business, jam packed with parts and supplies! Steeve worked his wonders on the cassette, and had Terry ready to go in minutes. And he did the fix for free – what a great guy!! We all took off towards Fredericton, and then the rain started. The forecast had said the rain should be ending this morning, but it was just beginning. It got stronger as the morning went on, which was not a problem on its own, but when you add in the hilly terrain, and very tired legs, it was definitely feeling like work. At one point, we were on a steep hill, and the rain had picked up so there was a stream of water running downhill as I was pushing uphill. I felt like a spawning salmon, swimming up-river against the flow. At that point we re-evaluated our day. We’re scheduled to meet with the mayor at 4:00pm, and with the slow advance we were making today, we decided to leap frog, to ensure we weren’t late. Leap-frogging means one cyclist goes forward for 15 kms, while the other 2 ride in the RV, eat lunch and rest. The RV shuttles ahead 15 kms and lets one cyclist leave to do their shift, then waits for the other rider to arrive, load up, and then shuttles forward again. This way we can cover more ground quickly, and keep on schedule. This is a necessity when we have speaking engagements or meetings. The rain tapered off to just overcast skies. 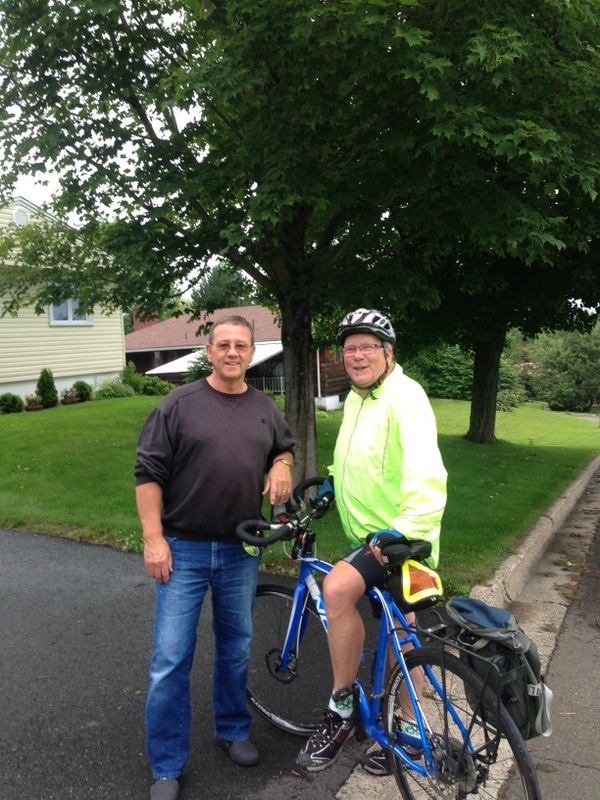 When we were about 12 kms out of Fredericton, we all started cycling together again. At least for a while, until Terry got another flat, except this time in his front tire. 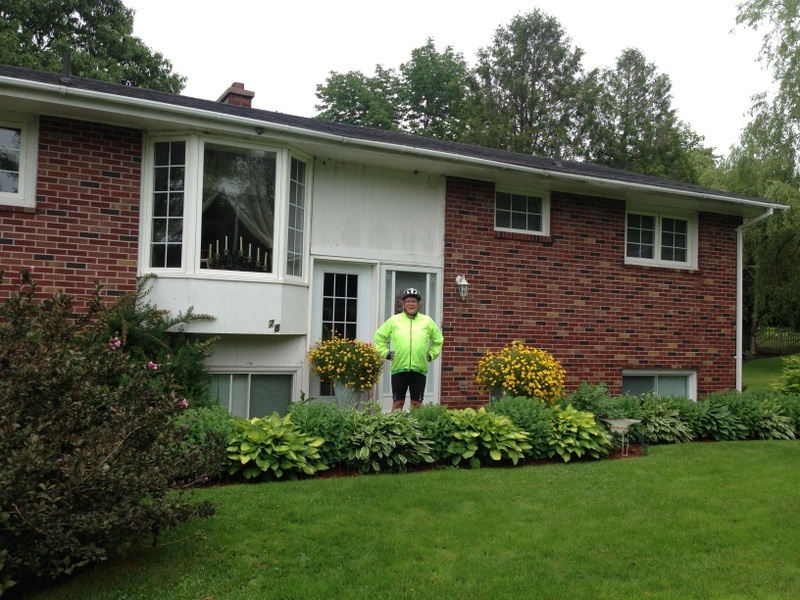 As he fixed that, Bill and I went for a roll down memory lane, as we were in his old neighborhood of Silverwood. We visited his old school, the house he grew up in, and we even ran into a past teacher of his from junior high. Bill was beaming as he reconnected with his old stomping grounds. He said that the big hill he used to cycle up as a kid (which we had to go up to get to his street) was definitely as steep as he remembered! Terry and Al rejoined us and we made our way to downtown and City Hall. There we were greeted by and Bill’s brother Ed, his wife Wendy and their daughter Katarina, and later by Anne-Marie from our partner charity, the Family Enrichment and Counselling Service. 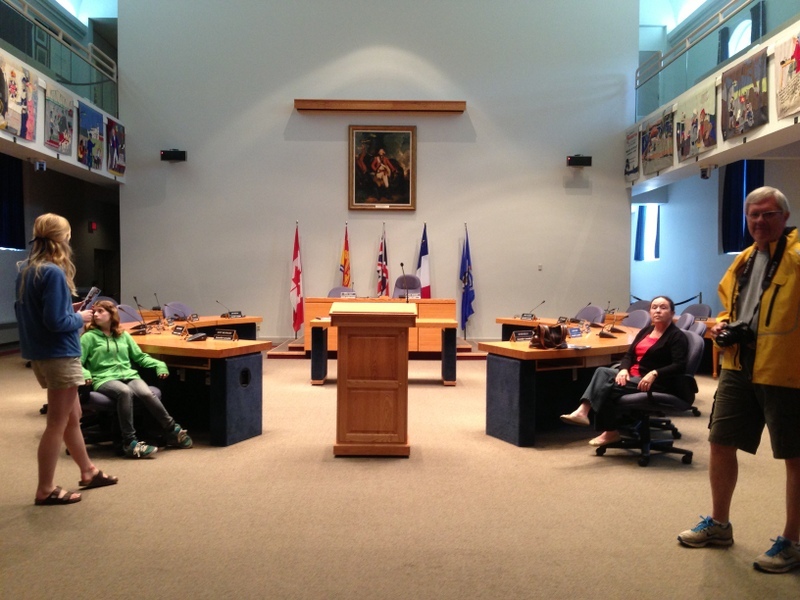 We were all invited into city hall, given a tour of their historic tapestry series in the council chambers. We met the deputy mayor, Stephen Chase, who was very gracious and showed great pride in his beautiful city. 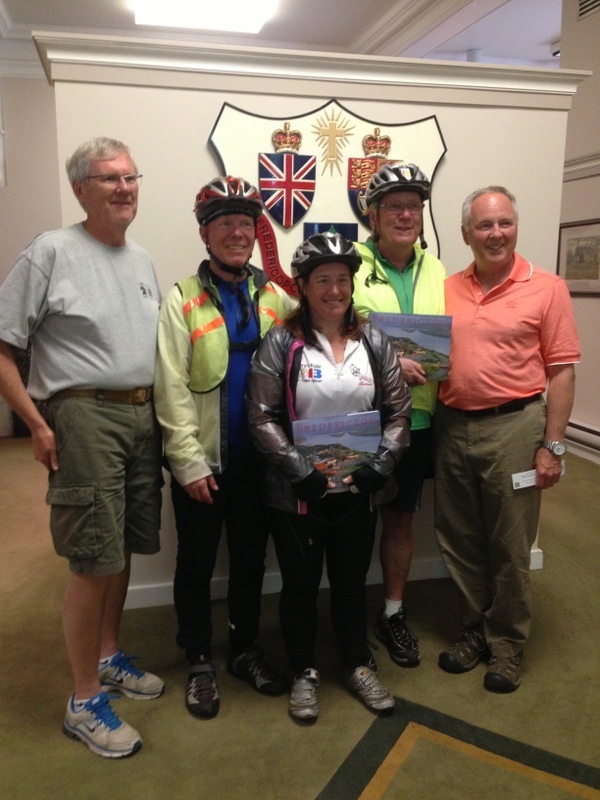 He presented us with Fredericton books and pins, and said the office would make a donation to the ride. What a royal welcome we received, it was very special! On the way to city hall, I heard a loud pop, and suddenly my rear derailleur would not work. I had snapped a cable, but it couldn’t have happened at a better time, as we were just a couple of blocks away from the Radical Edge bike shop. I left my baby in Brian‘s capable hands, to see if he could fix the cable, or if I had to spring for expensive new shifters (gulp!). As long as I can be back on the road after our break, that is what matters. 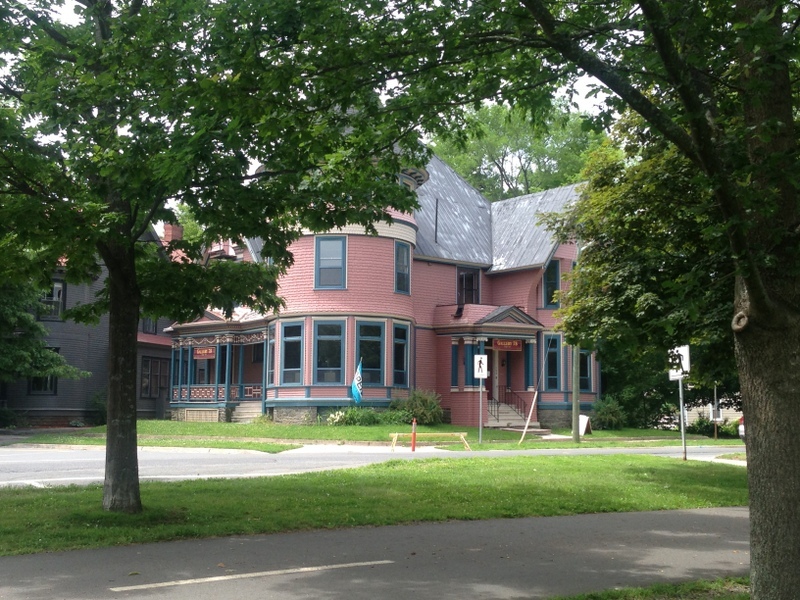 The team and Ed’s family then went for dinner at a long-time Fredericton institution – The Cabin. It was a Tuesday night, but the place became packed shortly after we got there. Bill told us stories of eating there when he was young, and the cook “Tex” who would always say “Billy – the usual?” when he walked in. Terry, Al and I had a delicious lobster roll, my first ever, and their famous bread pudding for dessert. 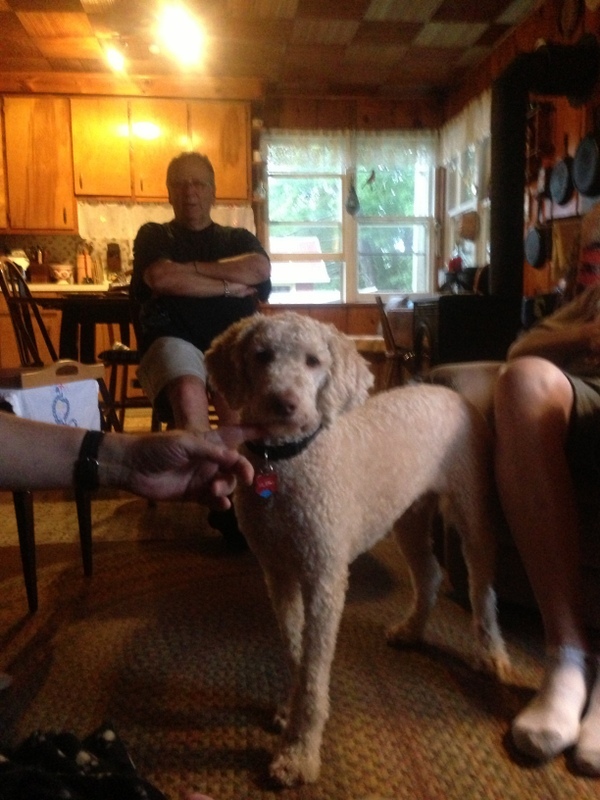 We made our way to Ed’s place for the evening, had a good visit, did laundry and played with their pets, including Murphy their poodle cross puppy. But it was an early night again to regain some energy for the concert the next evening. I’m getting pretty tired after two months on the road, so the more sleep I can stock up on, the better. And I’ve started my count-down of sleeps until I see Patrick again in Newfoundland on July 11th. We slept in a bit today – even Terry, who is usually our alarm clock, getting everyone moving on time in the morning. We all got up before him today, and it was so out of character that I almost thought I should go check and make sure he was still breathing! It was a lazy morning, working on computer stuff and laundry, and having a really late breakfast. 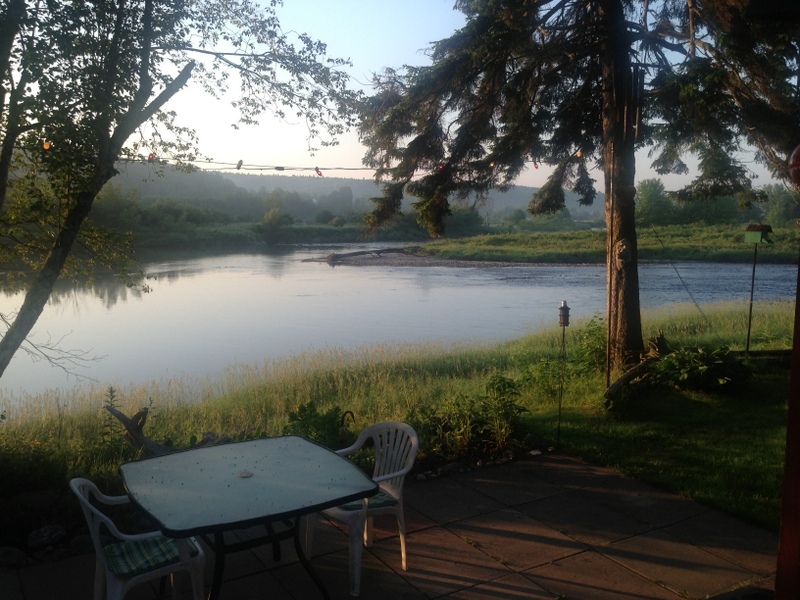 Ed and Wendy are located right on the Nashwaak river, so they have a wonderful view from their yard. But we are back in black fly territory, so we need to keep covered. But the one fly I was thrilled to see were the fireflies, lighting up the yard last night. There is something so magical about them, they make you feel like a kid again. I contacted the bike store, and was so relieved to hear that my bike was fixed, they only needed to replace the cable. 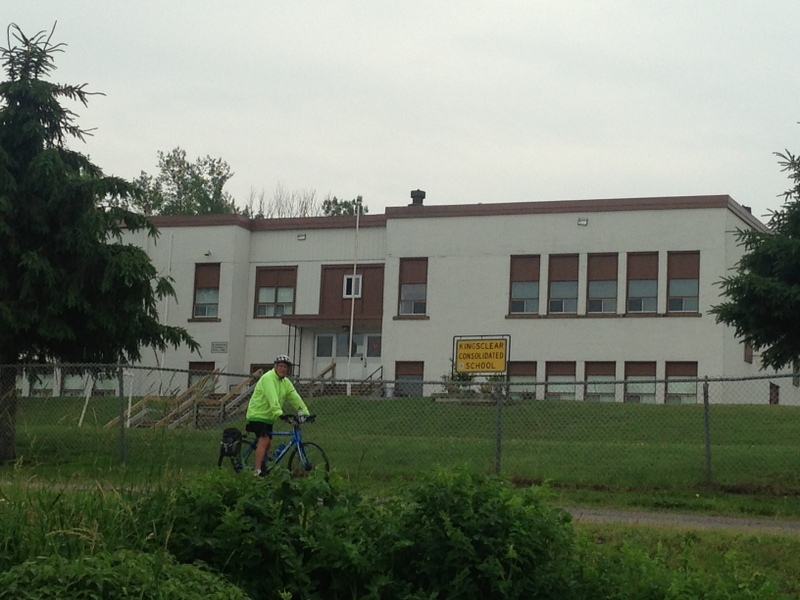 We headed into Fredericton to pick up my bike, as well as see the city. Bill gave us a tour of the areas he used to haunt as a teenager, but was pretty disappointed that they didn’t contact him before they changed the directions of some of the one way roads. Bill needed to take my bike back and pick up Ed, Wendy and Katarina for the concert, so he dropped us off downtown to keep exploring on our own, and meet at Dolan’s Pub by 4:30pm for the evening festivities. The concert was wonderful fun. There were lots of friends of Ed’s and of our partner charity, Family Enrichment and Counselling Services. Anne Marie and her volunteers had a nice selection of info for people to take, and were also having a 50/50 draw. I donned a black apron to sell the tickets both in the pub and on their patio, and everyone thought I was a server. One woman who had several glasses of wine did not want to accept that I couldn’t bring her more – I had to run into the restaurant to get someone to go serve her, as I feared for my safety if I didn’t deliver! We got to experience several bands that were new to all of us. First up was Lava and Doug, a father/daughter team, with their bass player Caeser. Lava played the flute and had an angelic voice, and it’s always nice to see families that play together. 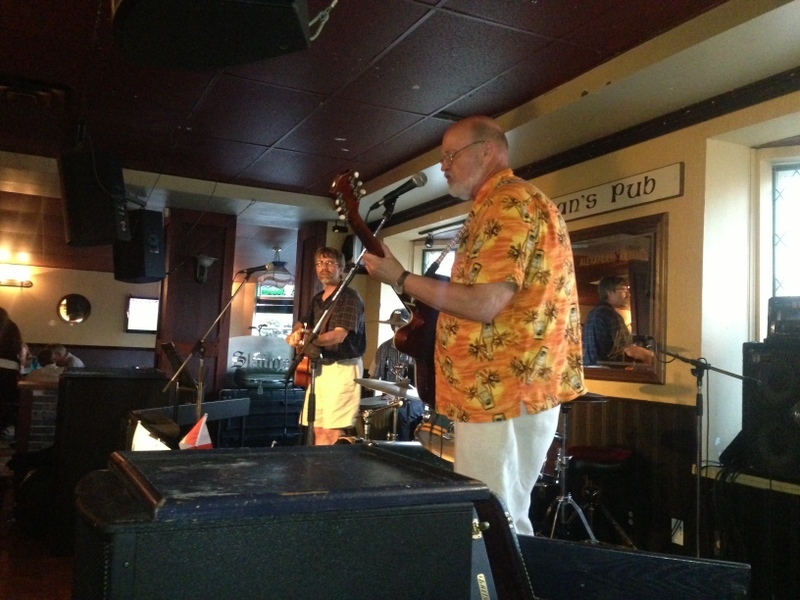 Next up was John Fidler and the Suspects, who played more of a rock and roll set. I was dancing as I sold tickets, and many patrons were bopping, I’m sure wishing there was a dance floor. The next band, Somerville, played lighter original tunes, and was fronted by Anne Marie’s husband. They reminded me of the band “America”, and the lyrics were quite introspective. I wish I could have heard them in a quieter room to fully experience the meaning of each song, but it was a pub atmosphere and therefore a little noisier than I’m accustomed to when we go to folk clubs. 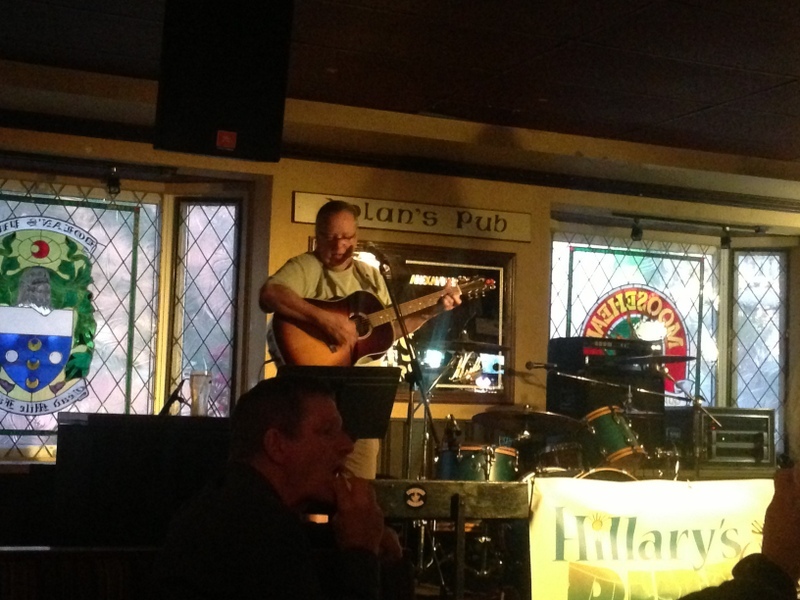 Bill closed the night off with a full set of songs, and because he also MC’d, he was able to speak quite a bit about Hillary and the ride. We also got to connect with a vibrant young woman from the United Way, who wrote a wonderful blog entry about the ride. 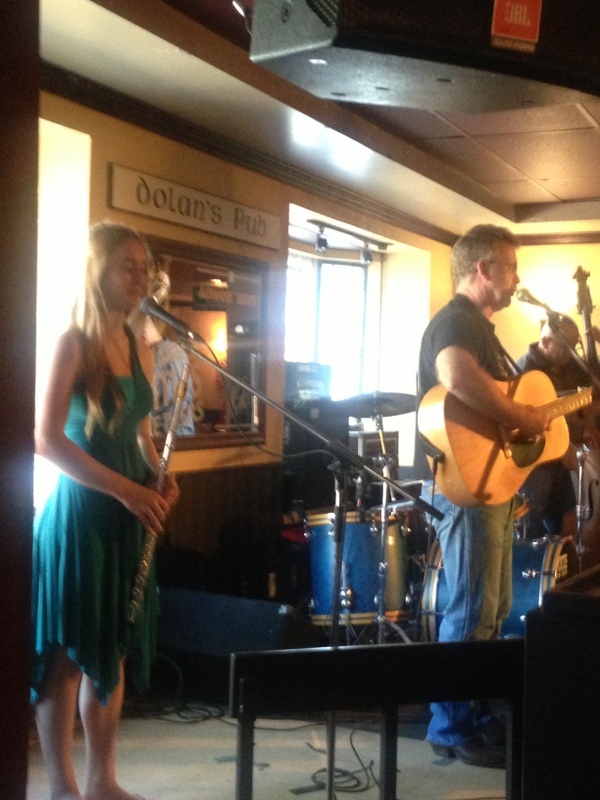 We send a big thanks to Dolan’s pub and their staff for the room and keeping everyone fed and watered, and to Anne Marie for her enthusiasm and hard work. 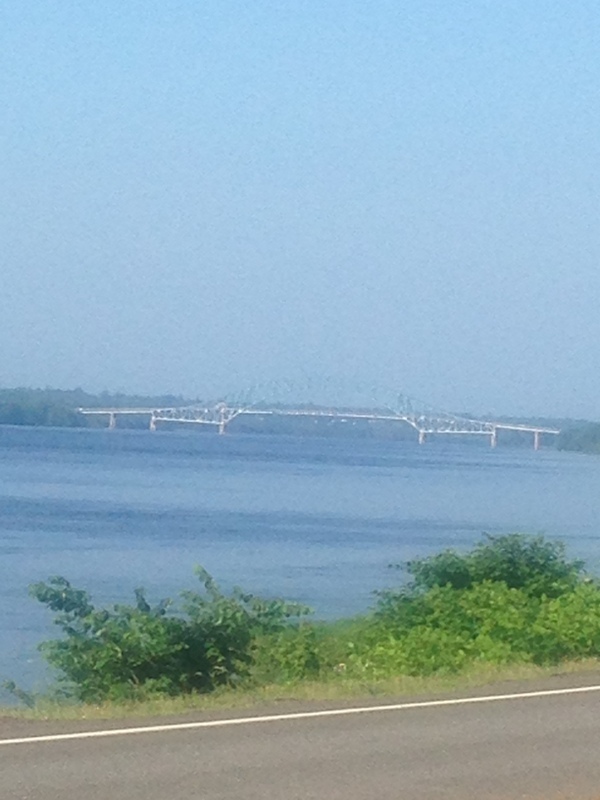 Our day off was over, and we were back on the road again, heading out from the east end of Fredericton. We had several options of routes today to take us to Sussex, and it’s always a crap shoot when you try to pick a good side road from a map. You have no idea how the shoulders will be, how hilly it will be, and how much traffic. It was a real scorcher today – 32 degrees with a humidex of 40, so we wanted some shade and very few hills. 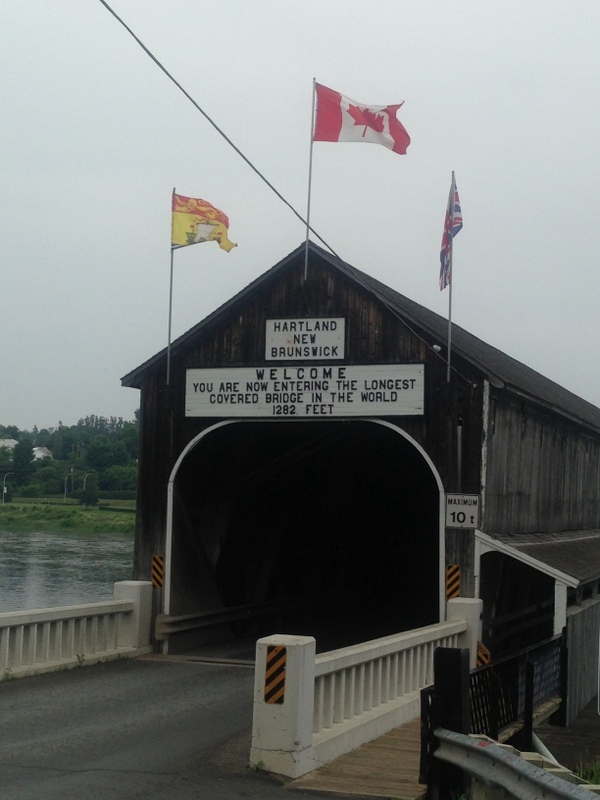 This time our choice was the right one, and we had a lovely country road experience taking Hwy 710 and 10 to Sussex. We needed to make up some extra kms today and tomorrow, as we wanted to get ahead of schedule so we could shuttle to Confederation Bridge instead of cycle it. 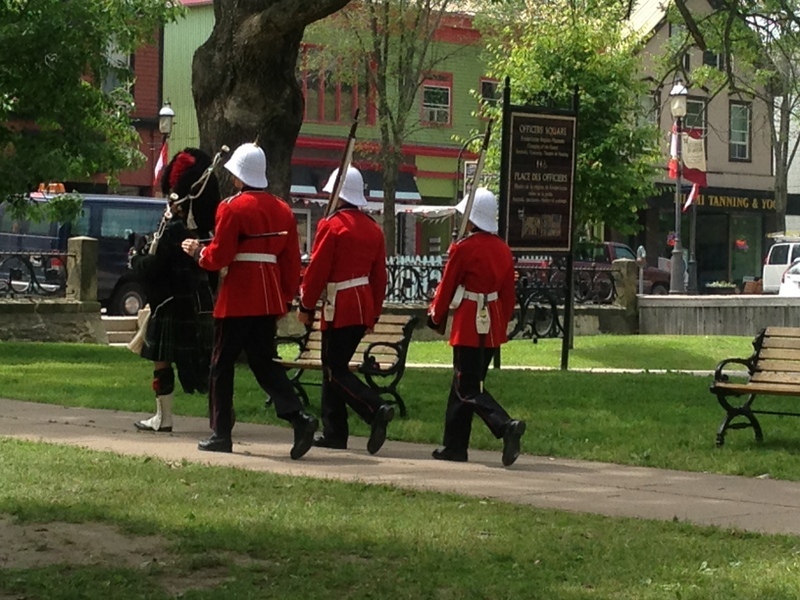 This is so we could shorten our day, as our concert in Charlottetown starts early at 2:00 pm. So we arrived at Sussex at the Tim Horton’s for frozen lemonades, and met Greg and Jane there, to get directions to their home, and get help picking a route to do our extra 40 kms or so for the day. We did a loop out to the town of Norton, which took us through a lovely scenic green valley. Even though there was a headwind on the way out, it was a fairly pleasant ride as the wind cooled us down to a reasonable temperature. We headed back on the main highway, past Sussex to Greg and Jane’s place, which is by a golf course. 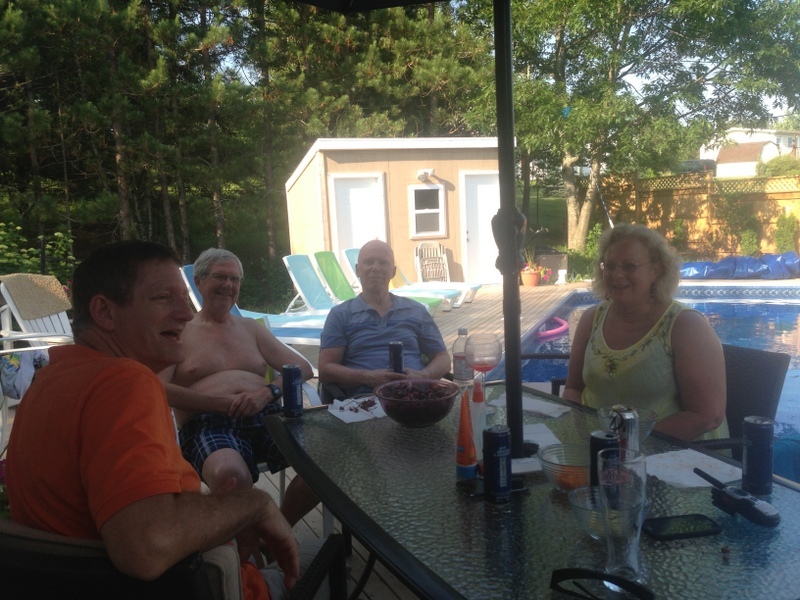 It took us no time to get into our bathing suits and into their back yard pool to cool down. There’s nothing like floating on pool toys with a cold drink after a hot day on the road. Greg is an old time friend and neighbor of Bill and his brother Ed, he even named his son after Ed. He shared funny stories of growing up together, tormenting their teachers and each other, and basically getting into mischief. 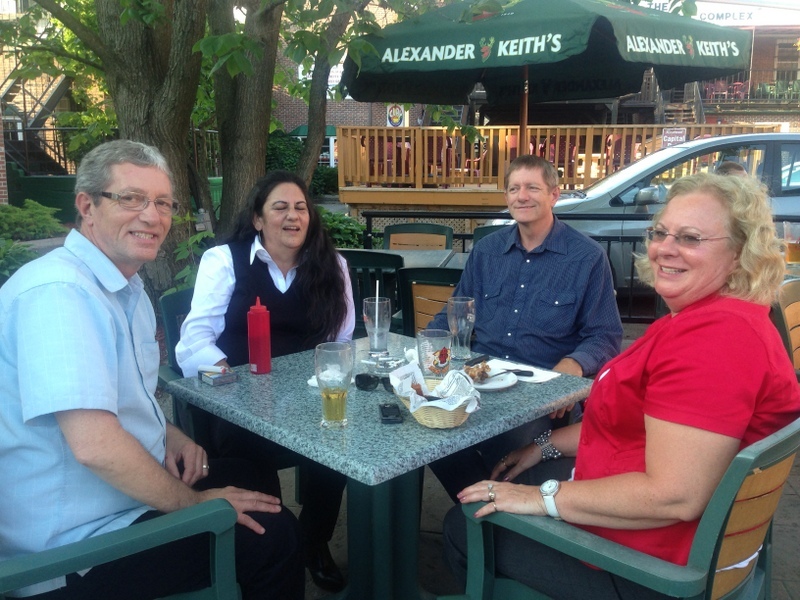 Lots of laughs were had, and we had an amazing barbecue dinner out on the patio. I think I should bike across Canada every year, I’ve never been spoiled so much in my life. I had to drag myself out to the RV, as we were having such a great time, I didn’t want it to end. But every morning is an early morning, and I pay a dear price for late nights. I hope you are getting as much rest as you can…it must be hard to endure the bad weather and long days on the bike! But I am sure you get all pumped and energized by all the wonderful folks you meet along the way…isn’t that the BEST part!!! There are such kind and considerated souls all over the country!!! Take good care and big hugs to you all!! !